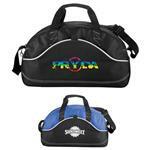 We love this promotional duffel bag! Weekender duffel bag is perfect for quick trips. 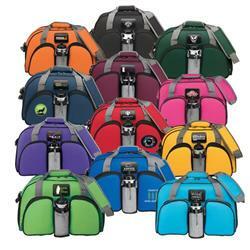 Made from 600D polyester, this rugged bag features: a large zippered main compartment for sport or weekend wear, two zippered front pocket organizers for accessories, padded handle and adjustable shoulder strap, front mesh pocket for water bottle (not included) or accessories, and a permanent hard bottom. Production Times Available: 5-10 working days. Inquire for rush production. Available Imprint Options: Price includes a deboss or single color imprint. Additional imprint colors, please add $0.70 per piece. Additional locations, please add $1.25 per piece. Inquire for embroidery.